Kenneth Joseph Arrow (August 23, 1921 – February 21, 2017) was an American economist. He won the Nobel Prize in Economics with John Hicks in 1972. At the time, he was the youngest person to have received this award, at 51. Arrow was born on August 23, 1921 in New York City, New York. He studied at the City College of New York and at Columbia University. Arrow married Selma Schweitzer in 1947. They had two sons. In economics, he was thought be an important figure in post-World War II neo-classical economic theory. Many of his former graduate students have gone on to win the Nobel Prize themselves. Arrow was active on the international scene through a variety of initiatives including trustee of Economists for Peace and Security and a member of the Advisory Board of Incentives for Global Health, the not-for-profit behind the Health Impact Fund. Arrow died on February 21, 2017 from natural causes at his home in Palo Alto, California, aged 95. ↑ "Tamer of Big Businesses Wins Nobel Prize in Economics". Stanford.edu. October 14, 2014. Retrieved December 5, 2014. ↑ Weinstein, Michael M. (2017-02-21). 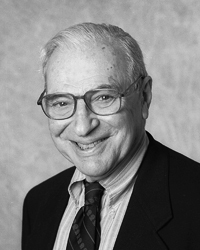 "Kenneth Arrow, Nobel-Winning Economist Whose Influence Spanned Decades, Dies at 95". New York Times. Retrieved 2017-02-21. This page was last changed on 18 November 2018, at 09:41.